Erik Larson, a contributor to Time magazine, is the author of The Naked Consumer and Lethal Passage (Crown, 1994). His work has appeared in The Atlantic, Harper's, and other national magazines. He lives in Seattle. G K Hall & Co. Hardcover. 0783889321 Please allow 4 - 14 business days for Standard shipping, within the US. Thank you for supporting our small, family-owned business! . Fair. 2000-02-01. Large Print Edition. 2000-06-03. New. Ships with Tracking Number! INTERNATIONAL WORLDWIDE Shipping available. Buy with confidence, excellent customer service! G K Hall & Co. PAPERBACK. 078388933X Very Good Condition. Five star seller - Buy with confidence! . Very Good. 1999-06-08. New. Ships with Tracking Number! INTERNATIONAL WORLDWIDE Shipping available. Buy with confidence, excellent customer service! G. K. Hall & Company, 2000-02. Hardcover. Good. Crown. Used - Very Good. Very Good condition. Very Good dust jacket. Crown. Used - Good. Good condition. Good dust jacket. Slightly dampstained. New York, New York: Crown Publishers, 1999. Book with slight bump to lower corner of each of rear boards, very slight crimp to spine ends, and hint of rub to lower edges of boards. No prev. owner name. DJ in plastic cover with price corner intact. Signed by Erik Larson with signature only on the title page. Awarded the 2002 Louis J. Battan Author's Award from the American Meteorological Society. Incl. Maps, Notes, Sources and Index. (xi) 323 pp.. Signed by Author. First Edition, 1st Printing. Hard Cover. Near Fine/Fine. 1999-05-06. Good. Ships with Tracking Number! INTERNATIONAL WORLDWIDE Shipping available. May not contain Access Codes or Supplements. May be ex-library. Shipping & Handling by region. Buy with confidence, excellent customer service! First edition with the complete number line; A fine book in a fine dust jacket with only trivial shelf wear to the bottom spine end. Signed and dated by the author on the title page. A handsome copy and an excellent read! Not remaindered, not price clipped, not ex-library. Housed in a protective archival cover and shipped in a sturdy box. 1999-04-09. Good. Ships with Tracking Number! INTERNATIONAL WORLDWIDE Shipping available. May not contain Access Codes or Supplements. May be ex-library. Shipping & Handling by region. Buy with confidence, excellent customer service! Fourth Estate Ltd, 2000-06-01. Paperback. Used:Good. Crown, 1999. Hardcover. New. 9.3 x 6.2 cm. New York: Crown Publishers, 1999 Advance Reading Copy. NFine. SIGNED BY THE AUTHOR on the title page, not inscribed. Softly bumped on front corner, otherwise crisp.. Signed by Author. First Edition. Original Wraps. NFine. Advanced Reading Copy (ARC). Ephrata, PA: Science Press, 1970. 36 pp. Covers spotted. Limited to 400 copies. . First Edition. Cloth. Good/Issued Without Jacket. 8vo - over 7¾" - 9¾" tall. New York: Vanguard Press, 1947. 294 pp. This copy belonged to the Iron Range proletarian poet Joseph Kalar (1906-1972) best known for his poem "Papermill". First Edition. Cloth. Good/No Jacket. 8vo - over 7¾" - 9¾" tall. Crown. Hardcover. 0609602330 New Condition. . New. Fourth Estate Ltd. Hardcover. 1857028414 New Condition. . New. Harpercollins Pub Ltd. PAPERBACK. 1857028422 New Condition. . New. 2000-06-03. Good. Ships with Tracking Number! INTERNATIONAL WORLDWIDE Shipping available. May not contain Access Codes or Supplements. May be ex-library. Shipping & Handling by region. Buy with confidence, excellent customer service! 1999-06-08. Good. Ships with Tracking Number! INTERNATIONAL WORLDWIDE Shipping available. May not contain Access Codes or Supplements. May be ex-library. Shipping & Handling by region. Buy with confidence, excellent customer service! London: Fourth Estate, 1999. Book. Near Fine. Hardcover. First Edition/First Printing. A square solid tight clean carefully read copy. This copy has some lightish soil to the edges of the text block. THIS COPY IS IN MY POSSESSION AND WILL NORMALLY SHIP NEXT DAY..
Diane Pub Co, 1999-04-01. Hardcover. Used:Good. G. K. Hall & Company, 2001-01. Paperback. Good. Crown. Hardcover. 0609602330 New Condition *** Right Off the Shelf | Ships within 2 Business Days ~~~ Customer Service Is Our Top Priority! - Thank you for LOOKING :-) . New. New York: Crown Pub, 1999. Book. N-Fine. Hardcover. First Edition/First Printing. A solid tight square carefully read copy. The priced jacket has some light edgewear else fine. This copy has some light pagedge soil else fine THIS COPY IS IN MY POSSESSION AND NORMALLY SHIPS NEXT DAY..
VINTAGE. New. 8.68 x 5.28 cm. Fourth Estate Ltd. Hardcover. 1857028414 Like New Condition. . Fine. Harpercollins Pub Ltd. PAPERBACK. 1857028422 Like New Condition. . Fine. Crown. Hardcover. 0609602330 Like New Condition. . Fine. Diane Pub Co. Hardcover. 0756756227 . New. New York: Crown, 1999. Author's first book; stated First Edition with full numberline; not price-clipped. First Printing. Hard Cover. Fine/Fine. 8vo - over 7¾" - 9¾" tall. New York: Crown Pub, 1999. Book. Very Good +. Hardcover. Signed by Author(s). Later Printing. A solid tight square carefully read copy. This copy has some pagedge soil, some light reading wear. The 25.00 jacket has some minor edgewear else fine. Nice over-all copy. THIS COPY IS IN MY POSSESSION AND NORMALLY SHIPS NEXT DAY..
New York: Crown Publiishers, 2002 552 pages. 262 pages in English and the rest in German. A like new fine copy.. Swiss Re Special Edition. Card Cover with Flapps. Fine. Approx. 4 3/4" x 8". New York: Crown Pub, 1999. Book. N-Fine. Hardcover. First Edition/First Printing. A solid tight square carefully read copy. This copy has some very light soil to the edges of the text block. The priced jacket has some light edge wear else fine. THIS COPY IS IN MY POSSESSION AND NORMALLY SHIPS NEXT DAY..
Crown. Hardcover. 0609602330 Special order direct from the distributor . New. 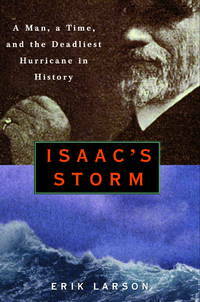 Story of the great Galveston hurricane of 1900 from the perspective of Isaac Cline, a scientist who thought he new all about weather. New York, New York, U.S.A.: Crown Pub, 1999. Book. Fine. Hardcover. 1st Edition. Turtleback, 2000-08-01. School & Library Binding. Good. London: Fourth Estate, 1999. First edition, first printing, fine in very good dustjacket. Indigo blue hardcover with color illustrated dustjacket, 385 pages. Looks and feels new and unread, firm binding, no names or other markings. The mylar protected dustjacket is not priceclipped and has some shelf soil and a light smudge to the white rear panel, no chips or tears.. First Edition. Hard Cover. Fine/Very Good. 8vo - over 7¾" - 9¾" tall. Crown. Hardcover. 0609602330 . New.